LOTS of garlic. Yes, please! Butter and garlic. What could be better? Me, slaving over a hot stove. I rarely watch television. When I do, I usually end up staying up really late, kicking myself in the morning when my two year old wakes up with the chickens. I have to peel myself out of bed at 4:00 am to get a run and shower in before he wakes up. I’ve always been an early riser, but it seems to be getting harder these days. Despite my early morning anguish, I occasionally fancy a little alone time. On this particular evening of late night freedom, I watched Food Network’s “The Best Thing I Ever Ate”. One of the featured chefs spoke of golden, glistening Asian garlic noodles that he had in Los Angeles. I had to have them!!! I Googled a few recipes and planned my trip to the Asian market, which happens to be in a sketchy part of town. Here are a few things I found interesting at the market. The two items I needed were yellow noodles and Maggi seasoning. I’ve cooked with neither of these items previously. 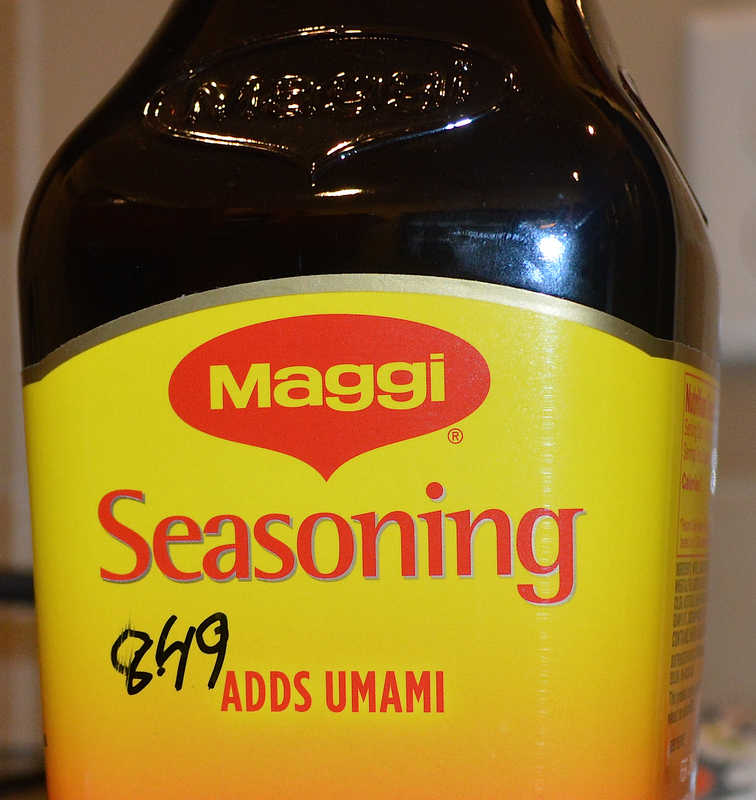 I found the Maggi Seasoning to be especially interesting, as it reads “Adds Umami” on the bottle. Umami is a fairly new taste classification and is difficult to describe. When I think of umami, I think of monosodium glutamate (msg), that additive that adds so much flavor to things like Ranch dressing mix, Doritos and Cheetos, bouillon cubes, multiple dipping sauces, pre-packaged seasoning mixes, instant noodles, some soups… I’ve written about aspartame in a previous post and I hold the same stance on msg Fact or Fad? Artificial Sweeteners Are BAD! I was certain this seasoning would contain msg. Lo and behold, it does. Sad face. Well, I guess I won’t be using this often. Like we dietitians always say, “everything in moderation”! If I use it again in another recipe, I certainly won’t blog about it. Mwah ah ah ah ah! I actually try to avoid msg as well as BHT (currently being further tested for possible carcinogenicity by the National Toxicology Program of the U.S. Department of Health and Human Services). It’s in Quaker instant oatmeal and multiple cereals. Why does food containing questionably unsafe additives remain on the market for uninformed consumers? I don’t know, but it makes my blood boil faster than I can get my noodles boiling, but that’s another post. I also avoid TBHQ, as well as artificial coloring, for instance yellow No. 5, Blue No. 1 and 2, Red No. 3 and 40, Orange B and Green No. 3. Thankfully, companies are starting to use more natural methods for coloring foods, such as beet and carrot juice and are even eliminating some of the colors in rainbow-tinted foods that can’t be achieved using natural color, like Fruit Loops. I do my best to support local farmers (Farmer’s Market Finds), support farming industries who protect the environment and humanely treat animals by purchasing organic foods when possible. 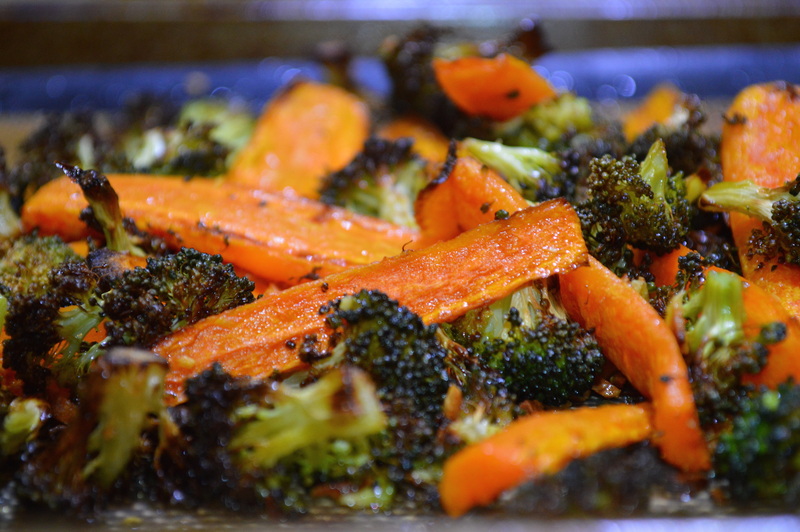 I avoid artificial ingredients as much as I’m able and do my best to feed my family fresh, unprocessed foods. Yet, I am a real person. I live in the same world you live in and my kids sit next to other kids at school who bring Lunchables, Cheetos and Capri Suns for lunch every day and they’re jealous! It makes my 13 year old the angriest with his most recent comment being, “Can we ever eat chicken nuggets with ranch and Cheetos for dinner?! Like, seriously; he was mad about it. To keep the peace, I buy cheese pizza Lunchables for one day each week when the older three are with us and sometimes I buy Cheetos. A bag of Cheetos only last a day around here anyway. I guess I can deal with one day of begging, pleading, fighting and overeating of junk food. Maybe they will thank me for my efforts one day. Maybe not. I am the evil step mother after all. Here’s the recipe for Garlic Noodles: 20 oz yellow noodles 1 heaping Tbsp Parmesan, grated Garlic Sauce: 1 stick unsalted butter 2 heaping Tbsp minced garlic 1 Tbsp Maggi Seasoning sauce 1 Tbsp oyster sauce 1 Tbsp fish sauce (Worcestershire sauce makes a fine substitute) 1 Tbsp sugar Rinse yellow noodles. Drain and set aside. Boil water, adding noodles once boiling and cook approximately 5-7 minutes. There wasn’t a cooking recommendation on the package so, check frequently so you don’t over cook them. Transfer noodles and drain well. I’ve used my pot like this more than I ever thought I would. Prepare garlic sauce using a sauce pan on medium to low heat. Add butter and melt. Add minced garlic and sauté about 2 minutes, but do not brown. Add seasonings to pan, stirring well to combine. Toss noodles with sauce. Add parmesan cheese and toss to combine. Serve immediately. Sliced green onions would make a lovely garnish. This is my favorite non-stick pan. I sprinkled with black sesame seeds. Super flavorful!! This recipe is getting its own page in my recipe book!! (Here are my running shoes. I’m going to need to use them a lot)! 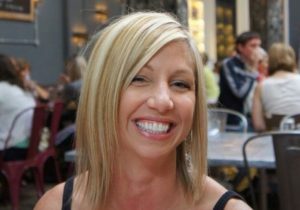 Read this post about Umami: Achieving Umami by Lauren Vardai, RD If you feel overwhelmed by all the nutrition advice, calorie recommendations and diet trends, read these: Fact. Not Fad., Let’s Crunch Numbers!, Help Me To Help You! Maybe you ate too much! Hehe!